Below are just a small handfull of my favorite downloads that I use with CFS2. Feel free to download and try them out. Supermarine Spitfire MKVb with clipped wings by VB Planes.This plane is a great dogfighter with great firepower and it turns on a dime.Excellent detail,easy on the frame rates,and easy to fly. This F1M2(Pete) is a great seaplane by Charles Simpson,Fly,martin & cryingtoto and some work by Nibbo.Very fun to fly,with great detail and some added splash sounds to go with it.A must have! This is a two plane package of the FWDX7 in a seaplane version and also a land based version by Charles Simpson.Both are excellent to fly and to use as patroling aircraft. SBSC Helldiver from VB Planes website,this plane is fun to fly and has a great sound file as well as great options. Early model Corsair with "birdcage" canopy from VB Planes.This plane is a great looking A/C as well as a great dogfighter. Superb representation of Germany's first great jet powered fighter from VB planes. This is a great 3 engine German Flying boat with great detail and very fun to fly. A great German single engine dive bomber by SFairs.I waited a long time for this one and it was worth the wait! This F2G-1 Super Corsair by Bruno Duffort is an excellent A/C with great detail as always from Bruno! This Curtis P40-K by Bruno Duffort is a great copy of the AVG Flying Tigers warhawks used in China after July of 1942.Very cool plane! 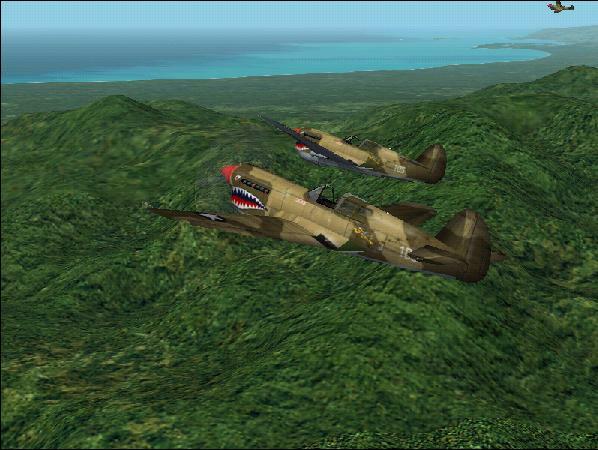 This P38J Lightning is to me the best P38 done so far,its download file is 9.2 meg but it is definitely worth it! This is a very fun Polish PZL P-11c high winged monoplane that I got from "The Outhouse" website and I fly this plane constantly.Its a slow plane but fun. This is a representation of a USAAF Spitfire Mk. IX flown by Capt. John Du Four. 336th FS/4th FG, at Debden, Sept 1942.Great looking and flying Spit! In Defense of Australia - 1942 this is a complete campaign mission pack with planes and scenery.This is by far the best add on for CFS1 or 2 and it even is better than the stock missions.A must have! You will need this for the above campaign,it adds a 52 gallon drop tank to the P40.